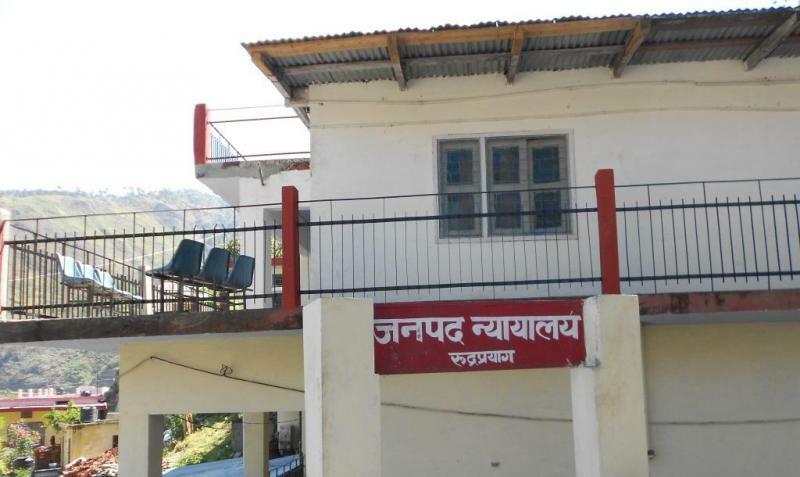 The District Courts in every district and outlying courts in some of Tehsil Headquarters in the State of Uttarakhand are established by the State Government in consultation with the High Court, taking into account the number of cases, topography of the place and population distribution in the district. There are three tier systems of courts functioning at the district level. These district courts at various levels administer justice in Uttarakhand under administrative and supervisory control of the High Court of the State. The highest court in each district is that of the District and Sessions Judge. This is the principal court of civil jurisdiction, which derives its jurisdiction in civil matters, like other civil courts of the state, primarily from The Bengal, Agra and Assam Civil Courts Act, 1887. This is also a court of sessions and sessions cases are tried by this court. Rudraprayag District was established on 16th September1997. The district was carved out from the following areas of three adjoining districts. 1- Whole of Augustmuni & Ukhimath block and part of Pokhri & Karnprayag block from Chamoli District. 2- Part of Jakholi and Kirtinagar block from Tehri District. 3- Part of Khirsu block from Pauri District. Internationally Known Shri Kedarnath Temple is at North, Madmaheshwar at east, Nagrasu at southern east and Shrinagar at extreme south. The holy Mandakini originated from Kedarnath is the main river of the district. Rudraprayag a small pilgrim town on the holy confluence of river Alaknanda and Mandakini, is venerated as one of the five sacred confluences or the 'Panch Prayag'. 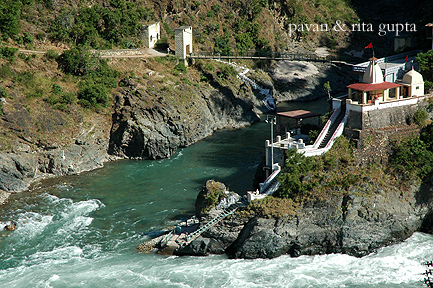 Rudraprayag is named after Rudra, an aspect of Lord Shiva. According to a legend, Lord Shiva appeared here as 'Rudra' to bless Narad Muni. Rudraprayag is of immense significance for the pilgrims of Char Dham Yatra, as it is the junction for visiting Badrinath and Kedarnath Dham. The entire region is blessed with immense nature beauty, places of religious importance and glaciers. Rudraprayag District was established on 16th September1997. Internationally Known Shri Kedarnath Temple is at North, Madmaheshwar at east, Nagrasu at southern east and Shrinagar at extreme south. 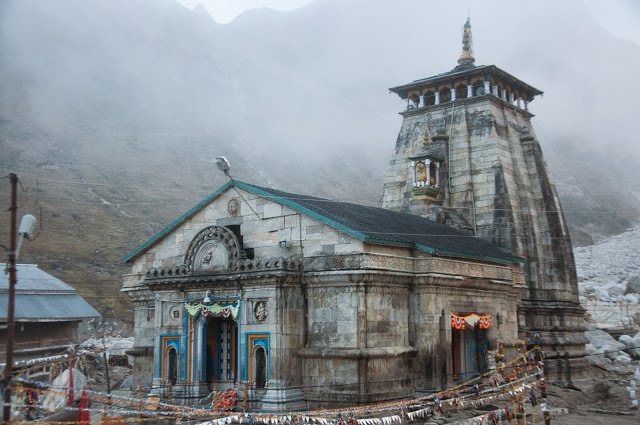 Kedarnath Temple the 8th century temple built by Adi Shankracharya, is a stark grey stone structure enshrining one of the twelve sacred Jyotirlingas of Lord Shiva. Panch Kedar or five Kedar lie in the valley between the rivers Bhagirathi and Alaknanda. According to a mythological legend, after the battle of Mahabharata, the Pandavas repented the killings of their cousins Kauravas and came here seeking forgiveness from Lord Shiva. The geology of the region shows that the Himalayas are the young mountains in the world. During early Mesozoic times, or the secondary geological period, the land mass now covered by them was occupied by the great geosynclinal Tethys sea . The probable date of the commencement of the elevation of the Himalayas is about the close of the Mesozoic period, but the unraveling of the story of their structure has only just begin, and in many cases no dating of the rocks is yet possible, though they include ancient and relatively recent crystalline intrusive, rocks and sediments allied to the peninsular part of India . The section of the range in the district is deeply cut into by the headwaters of the Alaknanda river, this trunk stream seeming to have reached a latter stage of development than its tributaries. This much, however, is known that there has been intense metamorphosis. In some parts uplift has been considerable since the mid-pleistocene period, in others there are great stretches of high but subdued topography and elsewhere there are the deepest gorges. As the elevation of the district ranges from 800 mts. to 8000 mts above see level the climate of the district very largely depend on altitude. The winter season is from about mid November to March. As most of the region is situated on the southern slops of the outer Himalayas, monsoon currents can enter through the valley, the rainfall being heaviest in the monsoon from June to September. Rainfall - Most of the rainfall occur during the period June to September when 70 to 80 percent of the annual precipitation is accounted for in the southern half of the district and 55 to 65 percent in the northern half. The effectiveness of the rains is, among others, related to low temperature which means less evapo-transpiration and forest or vegetation cover. However, the effectiveness is neither uniform nor even positive in areas where either the vegetational cover is poor or / and has steep slops or the soils have been so denuded that their moisture absorption capacity has become marginal. Temperature - The details of temperature recorded at the meteorological observatories in the district show that the highest temperature was 340C and lowest 00C. January is the coldest month after which the temperature begin to rise till June or July. temperature vary with elevation. During the winter cold waves in the wake of western disturbances may cause temperature to fall appreciably. Snow accumulation in valleys is considerable. Humidity - The relative humidity is high during monsoon season, generally exceeding 70% on the average. The driest part of the year is the pre monsoon period when the humidity may drop to 35% during the afternoon. During the winter months humidity increases toward the afternoon at certain high stations. Cloudiness - Skies are heavily clouded during the monsoon months and for short spells when the region is affected by the passage of western disturbances. During the rest of the year the skies are generally clear to lightly clouded. Winds - Owing to the nature of terrain local affect are pronounced and when the general prevailing winds not too strong to mask these effect, there is a tendency for diurnal reversal of winds, the flow being anabatic during the day and katabatic at night, the latter being of considerable force. Koteshwar Temple (3 kms) : The cave temple of Lord Shiva is located on the banks of river Alaknanda. There are several idols which have been formed naturally. Agatsyamuni (19 kms) : It is believed that sage Agatsyamuni meditated here. There is a temple dedicated to him. Guptkashi (39 kms) : This important pilgrim site has the ancient temples of Vishwanath and Ardhnareshwar. Ukhimath (40 kms) : It lies on the route to Kedarnath and is the winter residence of Lord Kedarnath, as well as the seat of the Rawal (head priest) of the Kedarnath temple. Gaurikund (72 kms) : It 's the trekking base for to Kedarnath. There is a temple of Gauri (Parvati) and hot water springs. Son Prayag : The sacred site on the confluence of river Basuki and Mandakani lies on the main Kedarnath route, about 5 kms from Gaurikund. The devotees believe that by mere touch of the holy water of Son Prayag, one attains the "Baikunth Dham". Trijuginarayan : It is 12 kms from Son prayag and is believed to be the site of Lord Shiva and Parvati's marriage. The eternal flame around which the marriage was solemnised, still burns here. Panch Kedar: The 'Panch' or five Kedar lie in the valley between the rivers Bhagirathi and Alaknanda. Kedarnath: Kedarnath, one of the holiest Hindu pilgrim site is perched at an altitude of 3584 metres amidst towering snowclad Himalayan peaks on the head of river Mandakini. It is 86 kms from Rudraprayag. Chorbari Glacier: The snout of the 6 kms long glacier is about 3 kms from Kedarnath temple. River Mandakini emerges from he~e and later merges into the Alaknanda at Rudraprayag. About 2 kms from the temple is the glacial lake of Gandhi Sarovar between the rock face and right lateral moraine of the glacier. Vasuki Tal (6 kms) : The charming lake at a height of 4135 metres is surrounded by lofty peaks. It affords an awe inspiring view of the Chaukhamba peaks. Madmaheshwar : It is one of the Panch Kedar site set at an altitude of 3,289 metres, about 25 kms north-east of Guptkashi. It can be reached by road from Guptkashi upto Kalimath, from where one has to trek upto Madmaheshwar. Tungnath : This another Panch Kedar site nestles at a height of 4090 metres, which makes it the highest Shiva shrine among the Panch Kedars. The nearest road head is Chopta (4 kms), from where one can trek or hire a sturdy pony. Chopta & Dogalbhita : Chopta is a village located in Uttarakhand state, India and a base for trekking to Tungnath, third temple of Panch Kedar which is at a distance of 3.5 km. Located at a distance of 1 km from Tungnath is Chandrashila Peak at 4000 metres plus above sea level, which offers a splendid view of snow clad Himalayan peaks. It provides a breathtaking view of the Himalayan ranges and surrounding areas. P.W.D. guest house is available at Dogalbhita 8 kms. from Chopta. Chandrashila : Chandrashila is most accessible peak of the U.P. Himalayas, at an Altitude of 3679 mts, especially since most of the peaks are difficult to scale. A climb to this mini peak in Rudraprayag district is arranged by Garhwal Mandal Vikas Nigam(GMVN). This combines scaling, skiing and trekking through a route of rich flora and fauna, lakes, meadows full of fresh snow in the winter months. The Chandrashila peak itself provides a rare panoramic view of innumerable snow clad peaks. Omkareshwar Shiva : This Omkareshwar temple at Ukhimath features superbly crafted and carefully maintained icon of Lord Shiva. According to folklore, Usha, daughter of Banasur had lived here once, thus giving Ukhimath its name. In fact, Ukhimath is dotted with temples dedicated to Usha, Shiva, Parvati, Aniruddha and Mandhata, including one with the image of Mahadev with five heads - similar to the one in Kedarnath. An idol of Usha’s confidante, Chitralekha, also exists. And among the several copper plates discovered, two relate to land endowments for the Kedarnath temple made by the king of Nepal in 1797 A.D. and by the mother of an official of the court of Nepal in 1891 A.D. Nearby is the Deoria Tal, which catches the reflection of the Badrinath peak, mirroring its grandeur. Kalimath : Kalimath is situated close to Ukhimath, and Guptakashi. It is one of the “Siddha Peeths” of the region and is held in high religious esteem. The temple of Goddess Kali located here is visited by a large number of devotees round the year and specially during the “Navratras”. Kartik Swami : 38 kms. from Rudraprayag on the Rudraprayag - Pokhri route is a village Kanak Chauri from where 3 kms. trek leads to Kartikswami. This place has a temple and idol of Lord Shiva’s son Kartikeya, situated at a elevation of 3048 mts., the place abounds in natural beauty and one can have a close and panoramic view of the Himalayan peaks. Maa Haryali Devi : A route diverting from Nagrasu, on the main Rudraprayag Karnprayag route, leads to the Siddha Peeth of Hariyali Devi. Haryali Devi is 22 kms. from Nagrasu which in turn is 37 kms. from the main town of Rudraprayag. At an altitude of 1400 mts. this place is surrounded by peaks and thick forests. According to the Hindu mythology, when Mahamaya was conceived as the seventh issue of Devki, Kansa threw Mahamaya violently on the ground. Consequently, several body parts of Mahamaya got strewn all over the earth. One part - the hand - fell at Haryali Devi, Jasholi. Since then it become a revered siddh peeth. There are 58 sidd peeths in all. Ma Hariyali Devi is also worshipped as Bala Devi and Vaishnav Devi. The temple houses a regally bejewelled idol of Ma Hariyali Devi, astride a lion. During Janamastimi and Deepawali this place is visited by thousands od devotees. On these occasions, the devotees accompany the idol of Ma Hariyali Devi, covering a distance of 7 kms. to reach Hariyali Kantha. The temple houses chiefly three idols namely, Ma Hariyali Devi, Kshatrapal and Heet Devi. From Hariyali Kantha one can see the mountain range in a semi-lunar spread. The splendor of the range is sure to fill one’s heart with awe. Indrasani Mansa Devi : The temple is situated in village Kandali Patti at a distance of 14 kms. from the main town of Rudraprayag and at about 6 kms. from Tilwara.It is believed to have been constructed in the age of Adi Shankaracharya. The temple has unique architecture surrounded by temple of Jalkedareshwar, Khetrapal and Jakh Devta. The origin of Indrasani Mansa Devi is described in Skandpuran, Devibhagvata and Kedarkhand. It is believed that Indrasani Devi is a Mansi Kanya of Kashyapa and is known as VAISHNAVI , SHAVI AND VISHARI. Folklore claims that the Devi cures persons who have been bitten by snake. By Road: Rudraprayag is well connected by road with important towns of the region.